Rain has been all over the news this week, for good reason. First Hurricane Harvey terrorized the Gulf Coast and now the downgraded storm is causing flooding throughout Tennessee. As my family ventured outside before the flooding started last night, my daughter and I realized we don’t own raincoats! So today’s deal is both to share with you and one I found out of necessity for my family. I don’t typically shop for premium name brands when I’m looking to replenish something in our wardrobe quickly, but when I found a North Face Waterproof Jacket for only $39.99 on Macys.com, I couldn’t believe it. When you go to shop this North Face waterproof jacket deal, you’ll discover two colors: the Black/Harbour Blue is still $90, but the Metallic Stone is on sale for the incredibly low price of $39.99. I love the neutral color of the Metallic Stone, as it will transition seamlessly from Summer to Fall and even early Winter if need be. The one downside to this deal is that it does not qualify for the extra 20% off Labor Day Sale promotion code. 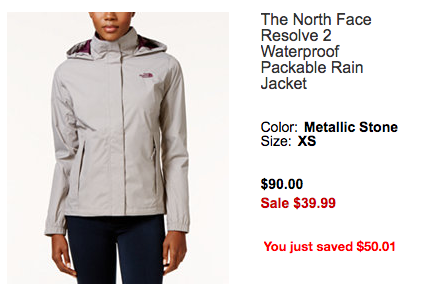 But at over 50% off on a North Face jacket, I’m not complaining. In addition to some gorgeous winter coats & pea coats, you’ll also find this Columbia Switchback II Omni-Shield™ Water-Repellent Jacket in 8 colors for $39.99 and even the Bright Rose for just $26.99. So don’t wait until the next storm and cold weather to pick out your perfect fall fashion statement. At prices like these, sizes will be flying off the site very quickly!